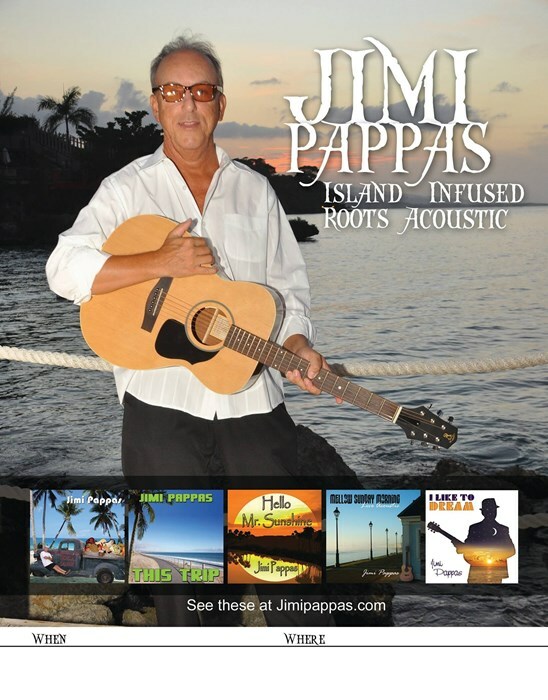 Jimi Pappas-As a solo acoustic performer can play a wide mix of tunes or just ambient guitar -- Jimi's live sets are known for his soulful renditions of James Taylor's songs, and he can give you his (One Man Band) A Tribute to James Taylor or bring you from the Beatles to Buffett. With 4 original music CD's out, Including his latest ( Hello Mr. Sunshine) voted # CD of 2011 on Beachfront Radio, also can be heard on XM Radio Margaritaville ! Jimi also picks classic rock gems and gives them an acoustic treatment. Jimi provides a mellow music experience with state of the art equipment and top notch musicianship. As a singer/songwriter his original tunes are a blend of Americana meets pop and brings out his love of tropical places and wide open spaces. Jimi has performed live all over the world spanning all 50 states, Cananda,Japan,Australia,Brazil and more. This has included world tours as drummer for Chubby Checker. Also portraying John Lennon and Ringo in Beatlemania, and at Walt Disney Worlds EPCOT. 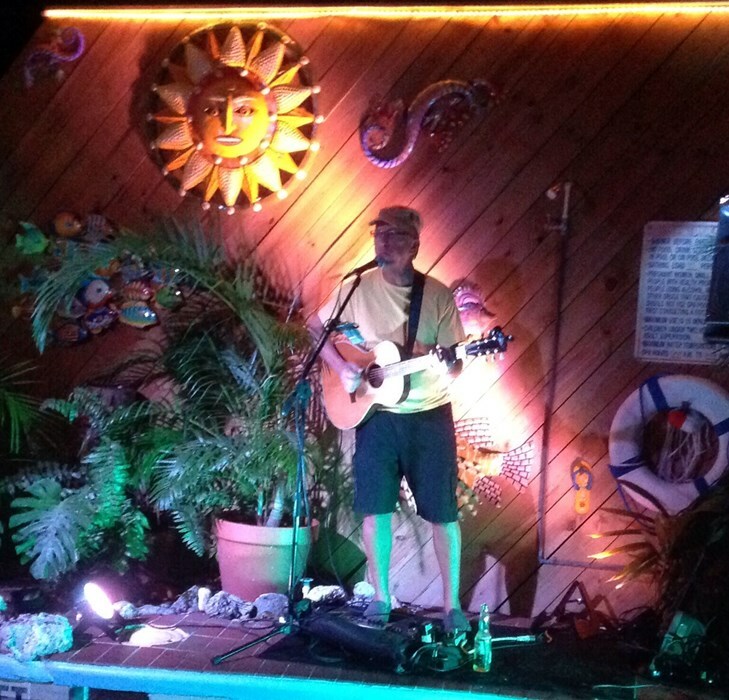 With over 30 years experience, and now focused on his acoustic shows, Jimi is perfect for wine events, birthdays,receptions,house/beach parties,weddings,corporate events,tiki bars,fairs,festivals and art shows. Jimi is a very low-key, relaxed entertainer. His style of music and his overall personality was a perfect match for our beach event. Jimi also helped prior to the event to be sure guests did not enter the dinner area and engaged our guests in conversation. We were very impressed with Jimi and will request him for future events for our company in the Jacksonville area. Timely. Responsive. Great performance. I hired Jimi and his steel drummer to perform at a corporate function. Jimi responded to quote within a matter of hours of sending out a request for quote. They arrived to the venue and ready to perform early. Their set list was exactly what was requested, they did a great job! Easy to work with, very acommodating and great music. 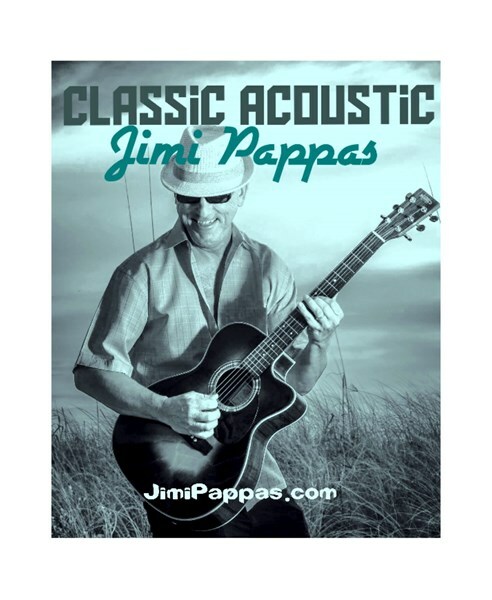 Jimi Pappas was extremely easy to work with and very accommodating. His talent was outstanding. This particular audience would have appreciated more of the familiar tunes of the Beatles and James Taylor for example and fewer original pieces. Everyone recognized Jimi's extraordinary talent. I have nothing bad to say about Jimi Pappas. He did an amazing job. My family absolutely loved him at out wedding. We had about 80 guests and i swear he kept everyone happy playing request after request. He was also extremely professionally and responded quickly to all of my emails. I am 100 percent happy with his performance. This was our 10th annual Christmas party and the first time that we had Jimmi...he was GREAT! Jim was excellent. I will book him again in the future. We hired Jimi for our (re)Grand Opening at our bar and are very glad we did! The selection of music he played was fun and energetic. This was the first entertainer we have had for our bar and we will be hiring him again for future events. I would highly recommend Jimi for any event!! Thanks Jimi! Please note Jimi Pappas will also travel to Winter Park, Lake Jem, Maitland, Goldenrod, Altamonte Springs, Clarcona, Fern Park, Gotha, Casselberry, Ocoee, Windermere, Apopka, Longwood, Winter Springs, Winter Garden, Kissimmee, Oviedo, Oakland, Lake Mary, Plymouth, Chuluota, Killarney, Sanford, Zellwood, Montverde, Lake Monroe, Saint Cloud, Ferndale, Intercession City, Sorrento.